As the story progresses, the narrator grows stronger, making this both a novel of a woman’s courage and a call to action against domestic abuse. A woman may need strength to be a mother of four, but she also needs a healthy dose of courage to help her get out of an abusive marriage. 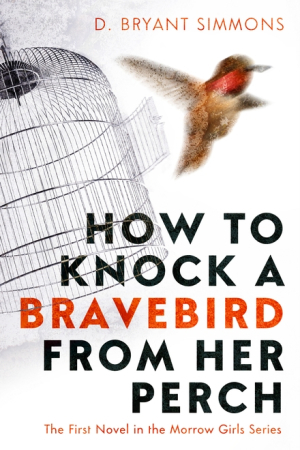 In her novel, How to Knock a Bravebird from Her Perch, author D. Bryant Simmons explores how much a mother will take before she decides whether to break or stand taller in this close look at the day-to-day life of a young mother of four during the 1970s as she copes with her wife-beating husband. Pecan never knew her mother, but her father raised her to be a quiet, gentle girl. When she was seventeen, Pecan’s father died suddenly, leaving her alone in the deep South. Instead of facing her fear of loneliness, Pecan marries her boyfriend, Ricky, only a week after she buries her father. As a boxer on his way to being noticed, Ricky convinces Pecan to move to Chicago, and, so far away from everyone she knows, she has no one to turn to when Ricky beats her for the first time. By their fourth child, Pecan has hidden more injuries than she can count. When she meets Heziah, Pecan realizes that not only is she lovable, but also that she deserves a gentle, loving man—and so do her daughters. But how can she escape Ricky, a man who could so easily kill her? Simmons takes on a tender subject by delicately cutting into a woman’s heart to show what might make her stay—and what it takes to get away. Pecan’s story is believable, and the writer skillfully walks the line of sentiment and strength, opening the door to understand Pecan and cheer her on throughout the novel. The story line itself is strong, but the dialect can get in the way. This occurs both in narration and dialogue, with all characters sounding the same. In narration, Pecan says of Ricky, “He ain’t wanna give her up.” In dialogue, Ricky tells Pecan she can pick out new furniture: “I left leave word at that store on Madison so you can go on down there and pick out some furniture. On credit.” The dialect creates a stumbling block and pulls away from the story itself. As well, much of the story is told in narration instead of scenes. Simmons breezes past significant moments, such as the birth of Pecan’s fourth daughter, a significant period since Ricky wanted a boy. Telling about events instead of allowing the moments to play out dulls the edges of the story. Although there are shortcomings, the power of Pecan’s story becomes a call to action and begs for attention. Simmons’s ability to tug at the heartstrings while her protagonist grows stronger plays out beautifully from the first to last page.